There are times when we all have to be away from home. Whether on vacation, family get togethers, work travel, etc. you will need to make arrangements for your hedgehog’s care in your absence. If you are going to be away for one night, your hedgehog will usually be fine on its own. You will want to make sure you have provided a good amount of food (preferably no moist food) in the bowl as well as a full (and working) water bottle. One of the most dangerous situations for your hedgehogs is extreme heat or extreme cold. A power outage could be deadly for your pet. If your overnight absence could turn into two nights or more, it is a good idea to have someone lined up to come and take care of your hedgehog, should the need arise. You can get stickers to put on your windows or doors to alert emergency personnel that you have live animals in the house, specifically hedgehogs, the number of pets, and the location in the house where they are kept. These stickers can be obtained through most emergency agencies, shelters, humane societies, pet stores, online, and mail order catalogs. It is also a good idea to alert a neighbor that you will be out of town. They can keep an eye on your house and be on the lookout for anything suspicious or hazardous such as a fire, flood, trespassers, etc. A sitter is recommended since your hedgehog’s water bottle could leak or stop working, food will need to be replenished or it can become soiled, your heat source could stop working, and your hedgehog could injure itself and suffer for days in your absence. Your pet sitter can be a friend, relative, neighbor, or a professional pet sitter. You can ask friends for a referral or look in the yellow pages or online for pet sitters in your area. It is important that you trust whoever will be caring for your pet as he/she would be entering your home when no one is there. The advantage is your hedgehog will not be too disturbed (if at all) by your absence since it is in familiar surroundings. The disadvantage is that most likely your hedgehog will be looked after only once a day. If your hedgehog were to fall ill or injure itself, it could be 24 hours before someone notices. You will need to make sure you have a good supply of the regular food and bedding for your hedgehog prior to your trip (you don’t want someone trying new food or bedding in your absence because they ran out of the usual supplies). If your heat source should stop working, you will want a back up and you need to instruct your pet sitter on how to keep your hedgehog in the proper temperature range. While handling your hedgehog is not a necessity, it is a good idea that your pet sitter be comfortable and confident in handling your hedgehog should the need arise. Your pet sitter will be able to check your hedgehog daily for any thing unusual if he/she is able to easily handle your pet. It is also nice if your hedgehog has some human contact while you are gone and has its usual out-of-cage time. It is a good idea to have a checklist of things that you want the pet sitter to do and to look out for each day. This way, no one gets confused and you know your hedgehog’s needs are being met. It is also a good idea to have your credit card information and permission to treat on file with your veterinarian in case of emergencies. Alert the hospital that you will be gone and that your pet sitter will be caring for and has authorization to seek treatment for your pet. Some vet hospitals will be happy to bill you if your pet needs treatment in your absence, but you must check what your veterinarians’ policies are before the need arises. In home boarding can be a good option if you are going to be away for a length of time and it would be difficult for someone to routinely visit your home. Benefits are that you have someone looking after your hedgehog more than a few minutes each day and prompt care can be provided in the event of an emergency. The disadvantage of home boarding is that the new smells, sounds, and surroundings may distress your pet. As mentioned above, you can have a friend, relative, neighbor, or a professional pet sitter care for your pet in their home. Some breeders offer boarding for hedgehogs as well. Some will only board hedgehogs that they raised for free or a small fee; others will board any hedgehog or small pet. The benefit of entrusting your hedgehog with a breeder is that you know your hedgehog has someone with experience looking out for it. The disadvantage is that your hedgehog “may” be exposed to something in the breeder’s herd or your hedgehog may introduce something in to the breeder’s herd. Water needs to be considered as well. Now is not the time to switch the type of water your hedgehog drinks. So take jugs of your tap water if that’s what you use, or take enough bottled, filtered and boiled, whatever you use, to last until your return. Your veterinarian may be another option. Some clinics offer boarding for exotics. As mentioned above, you will need to take food, water, bedding, and other supplies for your hedgehog. The benefits of leaving your hedgehog in a veterinary clinic are your hedgehog will be looked after regularly and should a medical need arise your hedgehog is already there. One drawback can be that a vet clinic can be noisy, and as with the in-home boarding, undue stress can be caused from all the different surroundings. Moreover, not all vet staff are familiar with how to handle a hedgehog or know what is considered “normal” behavior. You will have to instruct them on how to care for your pet. Do not assume that because they treat hedgehogs, they are familiar in all care aspects. You may decide that taking your hedgehog with you is a better choice. 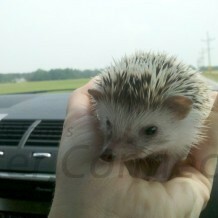 However, there are many things you need to think about before grabbing your hedgehog and proceeding to travel. You will need to make sure you can either take plenty of food, water, bedding, toys, blankies, or be able to get the exact same brands/types of these items at your destination. Since this cannot always be guaranteed, it is usually best to take your supplies with you. Water needs to be considered as well. Now is not the time to switch the type of water your hedgehog drinks. So, take jugs of your tap water if that is what you use, or bring enough bottled, filtered, and boiled, whatever type you use, to last the trip. Always take more food, water, and bedding than you think you will need as accidents can happen, food could get spilled or soiled, water can leak, etc. Keep in mind that where you are staying may be much cooler than your home temperature due to air conditioning in the summer or drafts in the winter. It is a good idea to take additional heat sources and a thermometer with you so that your hedgehog doesn’t risk getting too cold. You need to consider the following points before deciding to take your hedgehog with you while traveling: Where are you going? Will your hedgehog be welcome and legal to stay at your destination? How you will be traveling is another important consideration. Provided the above considerations are accommodated, your hedgehog will likely do just fine traveling with you. However, some hedgehogs may stress a little and go off feed or even pout. Keeping things as consistent as possible should help. Some hedgehogs simply don’t travel well and may be better off with a pet sitter. You will need to ensure your hedgehog’s safety by using an escape proof kennel for your trip. Buckling the kennel into a seatbelt can also help protect your pet in the case of a minor accident. Do not allow your hedgehog to roam loose in your car under any circumstance. Your hedgehog will need to have access to food and water during the trip and will also need to have the kennel cleaned when soiled. Depending on where you are going you must consider that in some states, counties, and towns, exotic animals are illegal. While it is not likely that you would get caught, you need to decide if that is a risk you want to take. Veterinary care is also something you need to consider. If something were to happen on your journey, how would you find a vet who is familiar and willing to see a hedgehog? If you are in a state where it is illegal, you would be hard pressed to find a knowledgeable veterinarian. You MUST not leave your hedgehog alone in your car for more than a couple minutes. As most people are aware, the inside of a car can reach great temperatures and quickly kill your hedgehog. The same needs to be said for cold weather. Your hedgehog could attempt to hibernate causing respiratory issues, infections to take hold, or even lead to death. You must be vigilant in assessing your hedgehog’s needs and comfort while on the road. Travel of any kind can be stressful for hedgehogs, so you must consider what the best option is for your hedgehog. Do not stress out your hedgehog just because you want your grandma who lives 300 miles away to see your new pet. If you are traveling by plane, you will need to call your airline to find out about their policies on live animals. Some will not allow an exotic animal in the passenger compartment and it must be checked in as luggage. Most airlines require a separate ticket for hedgehogs because they travel in a pressurized and heated cargo hold. Not all planes are equipped to have pressurized cargo cabins and this may effect your flight departure and arrival times. Flying with your pet can be quite costly. Many airlines require that hedgehogs have a Health Certificate filled out by your veterinarian before they can travel. All airlines require an airline approved travel kennel, food and water for the trip. Some airlines have temperature restrictions and will not allow animals on the plane if the temperature is too hot or too cold. In cold weather you will need to make sure your hedgehog has plenty of warm fabric to burrow in and possibly even disposable hand warmers for extra heat. Traveling by plane can be extremely stressful for any animal, and the benefits need to greatly outweigh the risks before you decide to take your pet with you. In conclusion, different hedgehogs will react differently to travel or in home accommodations. The only way to find out is take precautions and test different scenarios.